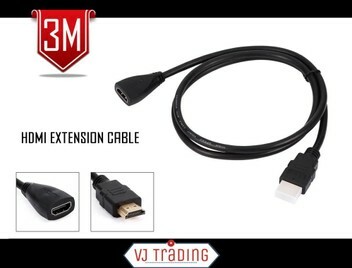 This high quality HDMI extension cable can be used to extend the length of an existing HDMI cable. It provides solution for many of your home entertainment needs. It could be applied to connect your HDTV to your Blu-Ray Player, Television, for Roku, for Boxee, for Xbox360, for PS3, Streaming Player, HD Cable Box, PC or any HD device with an HDMI output. Then you could experience high quality audio and video from your home theater. * The HDMI extension cable extends your existing HDMI devices or protect your HDMI interface on your high definition devices, triple shielding to enhance anti-interference. * The HDMI male to female cable compatible with any device that has an HDMI interface such as Blu-Ray Player, Television, for Roku, for Boxee, for Xbox360, for PS3, HD Cable Box, PC Stereos. * Gold plated connectors for resistance to corrosion and to maintain signal integrity. * The HDMI male to female Adapter works for extending cable length, supports 3D and 4K resolution. * Supports full 1080p HD viewing with digital transfer at rates up to 10.2Gbps. * Please see My Profile for Warranty & Details before purchase.